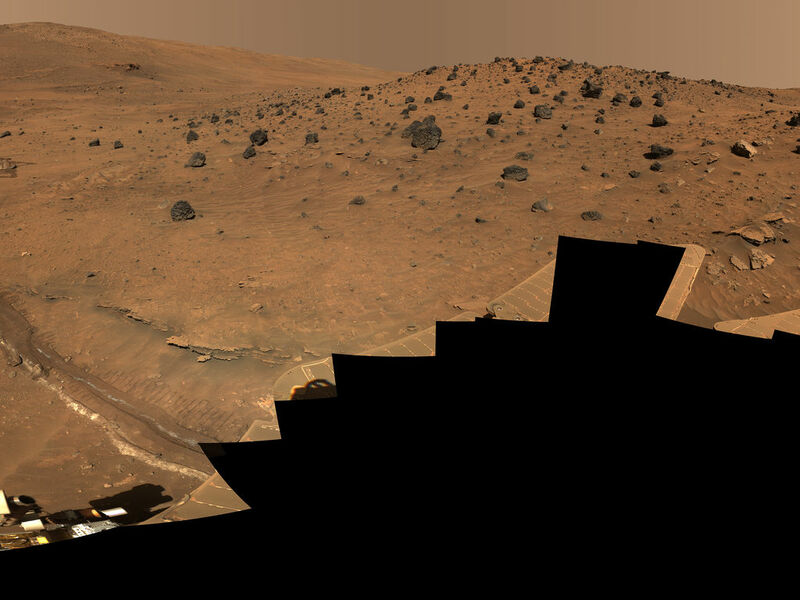 This 360-degree view, called the "McMurdo" panorama, comes from the panoramic camera (Pancam) on NASA's Mars Exploration Rover Spirit. From April through October 2006, Spirit has stayed on a small hill known as "Low Ridge." There, the rover's solar panels are tilted toward the sun to maintain enough solar power for Spirit to keep making scientific observations throughout the winter on southern Mars. This view of the surroundings from Spirit's "Winter Haven" is presented in approximately true color. Oct. 26, 2006, marks Spirit's 1,000th sol of what was planned as a 90-sol mission. (A sol is a Martian day, which lasts 24 hours, 39 minutes, 35 seconds). The rover has lived through the most challenging part of its second Martian winter. Its solar power levels are rising again. Spring in the southern hemisphere of Mars will begin in early 2007. Before that, the rover team hopes to start driving Spirit again toward scientifically interesting places in the "Inner Basin" and "Columbia Hills" inside Gusev crater. The McMurdo panorama is providing team members with key pieces of scientific and topographic information for choosing where to continue Spirit's exploration adventure. The Pancam began shooting component images of this panorama during Spirit's sol 814 (April 18, 2006) and completed the part shown here on sol 932 (Aug. 17, 2006). The panorama was acquired using all 13 of the Pancam's color filters, using lossless compression for the red and blue stereo filters, and only modest levels of compression on the remaining filters. The overall panorama consists of 1,449 Pancam images and represents a raw data volume of nearly 500 megabytes. 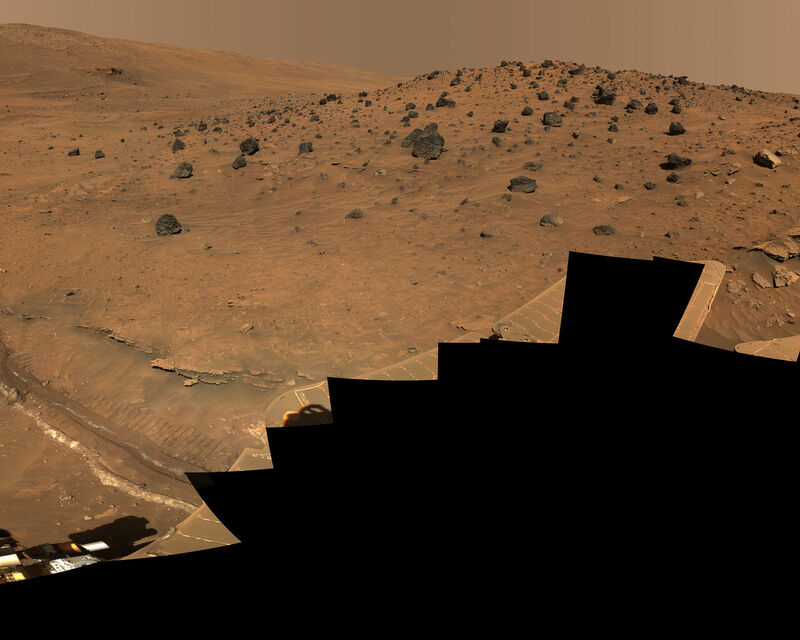 It is thus the largest, highest-fidelity view of Mars acquired from either rover. Additional photo coverage of the parts of the rover deck not shown here was completed on sol 980 (Oct. 5, 2006). The team is completing the processing and mosaicking of those final pieces of the panorama, and that image will be released on the Web shortly to augment this McMurdo panorama view. This beautiful scene reveals a tremendous amount of detail in Spirit's surroundings. Many dark, porous-textured volcanic rocks can be seen around the rover, including many on Low Ridge. Two rocks to the right of center, brighter and smoother-looking in this image and more reflective in infrared observations by Spirit's miniature thermal emission spectrometer, are thought to be meteorites. 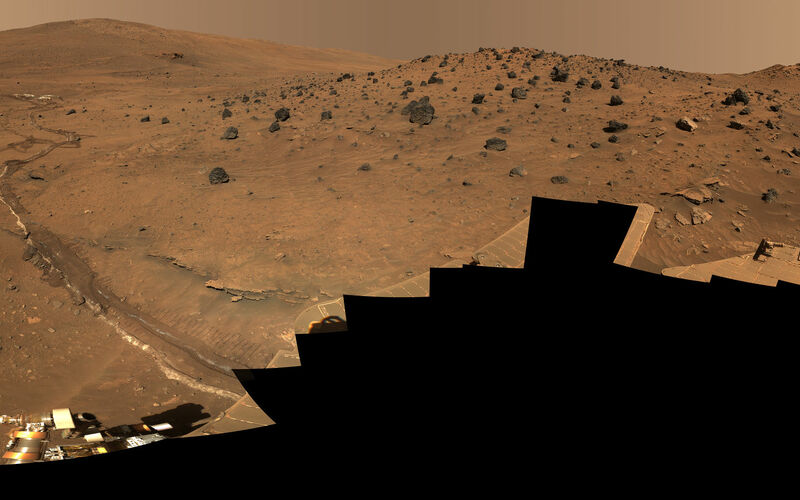 On the right, "Husband Hill" on the horizon, the rippled "El Dorado" sand dune field near the base of that hill, and lighter-toned "Home Plate" below the dunes provide context for Spirit's travels since mid-2005. Left of center, tracks and a trench dug by Spirit's right-front wheel, which no longer rotates, have exposed bright underlying material. This bright material is evidence of sulfur-rich salty minerals in the subsurface, which may provide clues about the watery past of this part of Gusev Crater. Spirit has stayed busy at Winter Haven during the past six months even without driving. In addition to acquiring this spectacular panorama, the rover team has also acquired significant new assessments of the elemental chemistry and mineralogy of rocks and soil targets within reach of the rover's arm. The team plans soon to have Spirit drive to a very nearby spot on Low Ridge to access different rock and soil samples while maintaining a good solar panel tilt toward the sun for the rest of the Martian winter. Despite the long span of time needed for acquiring this 360-degree view -- a few images at a time every few sols over a total of 119 sols because the available power was so low -- the lighting and color remain remarkably uniform across the mosaic. This fact attests to the repeatability of wintertime sols on Mars in the southern hemisphere. This is the time of year when Mars is farthest from the sun, so there is much less dust storm and dust devil activity than at other times of the year. This is an approximately true-color, red-green-blue composite panorama generated from images taken through the Pancam's 600-nanometer, 530-nanometer and 480-nanometer filters. This "natural color" view is the rover team's best estimate of what the scene would look like if we were there and able to see it with our own eyes.